Some days require keeping your nose to the grindstone, working your bottom off, and a couple pots of coffee to keep the pups primed. This is the opposite of that kind of day. The kids are in school, most of the tourists are between here and there. It is a day of reflection, listening to the birds by the bay, the gentle lapping of the wavelets against the pilings. … Tomorrow is another day, but today, I am comfortable. 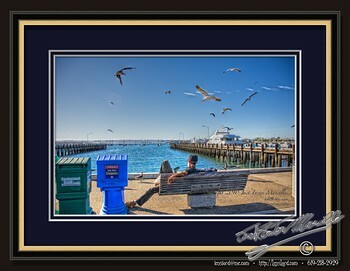 This entry was posted in Cityscape, Fauna, Landscape, Painterly, Purchasable - As Art Prints, Sea, Ships, Water. Bookmark the permalink.